Humanity is about to send its first ambassador beyond the solar system. No, it’s not a person and, no, there are no planned appointments with any alien representatives. Instead, after more than 30 years of flight, two machines are about to enter interstellar space. Launched in 1977, Voyager 1 has reached a region of space where the intensity of sub-atomic particles that are electrically charged has significantly increased. Scientists believe this indicates the probe is about to pass through the heliosphere. Stone has been the lead project scientist for Voyager 1 since the project was initiated in 1972. During the three years between January 2009 and January 2012, the number of cosmic ray encounters experienced by Voyager 1 has increased by 25 percent, Stone said. In the past few months the frequency of such interactions between the spacecraft and the polarized sub-atomic particles has dramatically increased. “Beginning on May 7, the cosmic ray hits have increased five percent in a week and nine percent in a month,” Stone said. The term “cosmic ray” is a historic artifact. It dates from a time when scientists incorrectly believed that the particles being encountered by Voyager 1 were electromagnetic radiation. Scientists now know that nearly all of the particles are protons, electrons, and atomic nuclei of the type commonly found on Earth. Cosmic rays travel at near-light speed. The Sun’s magnetic effect, which is dispersed through a region of space called the heliosphere, slows down the charged particles and causes them to change direction. Cosmic rays will be more concentrated in areas of the solar system that are close to the barrier separating the heliosphere from interstellar space. Voyager 1 uses radio waves to transmit data to Earth. The machine is equipped with a parabolic antenna, as well as a digital tape recorder that allows retention of data for later transmission. At present radio transmissions from the probe take more than 16 hours to reach Earth. 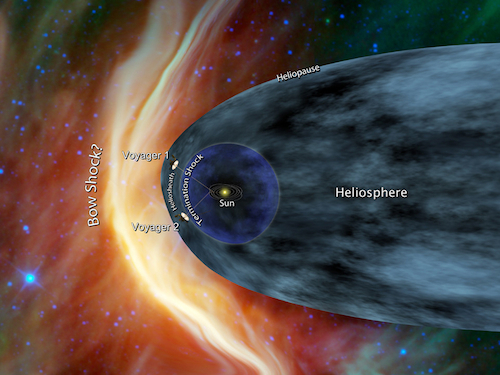 Scientists cannot be certain how much longer Voyager 1 will remain in the solar system because not all of the data sent back by the machine is consistent with a conclusion that the probe is at heliopause. The Sun generates charged particles which, in turn, surround the star. Those particles then disperse throughout the heliosphere. Scientists have not yet detected a marked decline in their intensity, which indicates the probe is not beyond the reach of the Sun’s physical influence. Voyager 1 is currently more than 120 astronomical units, or about 17.8 billion kilometers, from Earth. It is traveling at a velocity of more than 17 kilometers per second. Voyager 2 is slightly behind its sister probe at a distance of only 14.7 billion kilometers. Both probes were originally launched as tools to explore the outer reaches of the solar system. Voyager 1 explored Jupiter and its moons in 1979 and then, in 1980, the region of space occupied by Saturn and its moons. The official mission of the probe ended in November 1980 after it sent back to Earth the first detailed images of the solar system’s two largest planets. After leaving the solar system Voyager 1 will have a long journey before encountering any nearby stars. Upon completing about 40,000 more years of flight the probe will fly within two light years of the star AC+79 3888, which is in the constellation Camelopardalis.